Northampton County Emergency Management Services proudly presented four 911 telecommunicators with commendations last week to celebrate their outstanding performance during an emergency medical incident in late 2014. Telecommunicator Patrick Capuano was recognized with an Outstanding Service Award for providing life-saving CPR instructions to a 911 caller via telephone. By instructing a non-trained caller on how to provide CPR, TC Capuano was the critical link in the chain of survival that ultimately led to a positive outcome for the patient, who after months of recovery and rehabilitation, is now back to work. Additionally, TC Capuano was presented with the American Heart Association Heartsaver Hero award for his outstanding performance. 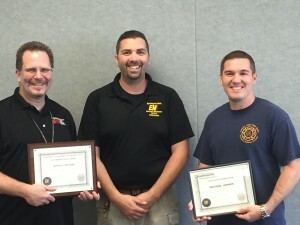 Telecommunicators Michael Lenner, Paul Little, and Monty Davis were also recognized with Certificates of Appreciation for their quick work in rapidly dispatching emergency services agencies and coordinating a multi-disciplinary response. Capuano and Lenner were able to meet with the patient whose life they helped to save in a celebratory event this past Friday at the 911 center. Positive outcomes, with minimal neurological deficits, from out-of-hospital cardiac arrests are directly related to early initiation of bystander CPR and immediate activation of the 911 system. It takes the work of many people to save a life and we at Northampton County Emergency Management Services are proud of the hard work our telecommunicators provide to support our community and our partners in EMS and healthcare in making a difference every day. Pictured above are Telecommunicator Patrick Capuano, 911 Operations and Training Manager Chad Marsh, and Telecommunicator Michael Lenner. Today marks NCEMS Director Robert Mateff’s last day of employment with Northampton County. 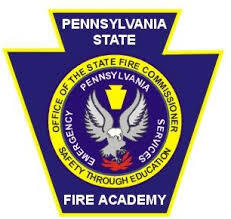 After 25 years of distinguished service to the residents of Northampton County, Bob will be leaving to assume the role of Pennsylvania Emergency Management Agency Deputy Director for 911. Bob served Northampton County as our first Director of the Division of Emergency Management Services after its creation in 2008. Prior to that, Bob held numerous roles within the Northampton County Sheriff’s Department including Deputy Sheriff, tele-communicator, and 911 Deputy Director. Bob’s dedication to the emergency management and emergency communications professions are evident by his distinction as both an Emergency Number Professional (ENP) and Certified Emergency Manager (CEM). Everyone at NCEMS would like to wish Bob congratulations on his transition to a new and exciting career! We extend our sincere gratitude for your exceptional leadership, integrity, and professionalism. Your distinguished commitment to excellence will be forever preserved in our hearts and our minds. Your zeal for our institution has made it a pleasure and an honor to have served beside such an exemplar.